She is a 1 year old, female, American Shorthair. 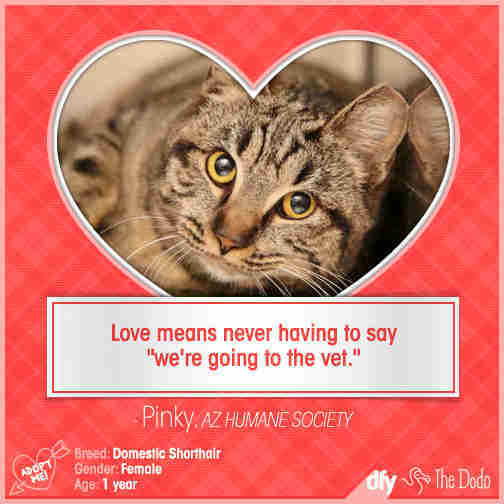 Learn more about Pinky at the Arizona Humane Society. This handsome fellow is about 13 months old, and he has "a curious and spunky personality. You could say he fits the stereotype of a fiery redhead!" 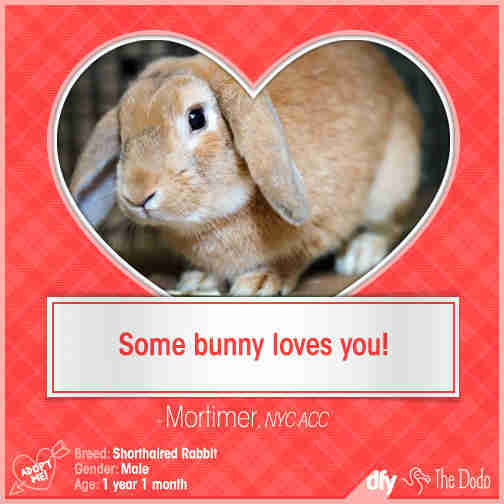 Meet Mortimer and other rabbits up for adoption at AC&C;'s Manhattan Care Center, at 326 E. 110th Street or email adoption@nycacc.org with his A#: A1024007. She is a 4 year old, female, American Pit bull terrier. 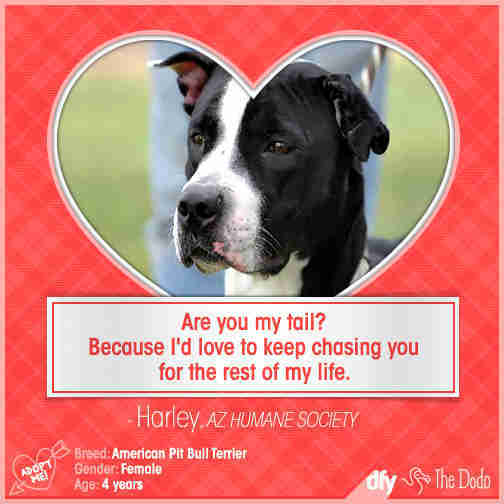 Learn more about Harley at the Arizona Humane Society. She is a 4 year old, female Tortie. 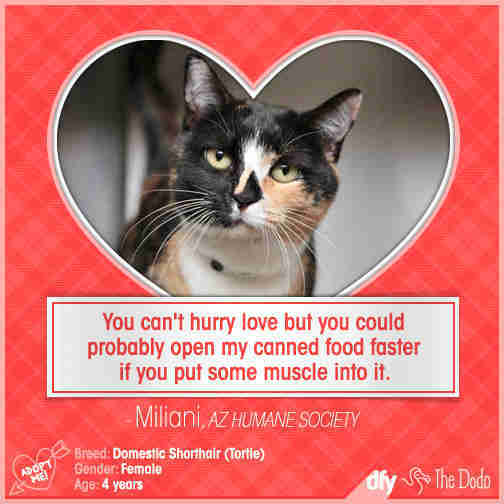 Learn more about Miliani at the Arizona Humane Society. This 1 year old pit bull mix "kisses, she lays on laps, she rolls, she play bows. Her whole body shakes with enthusiasm when she sees you, and she is equally thrilled to run full out with a ball in her mouth as lounge next to you and snore. 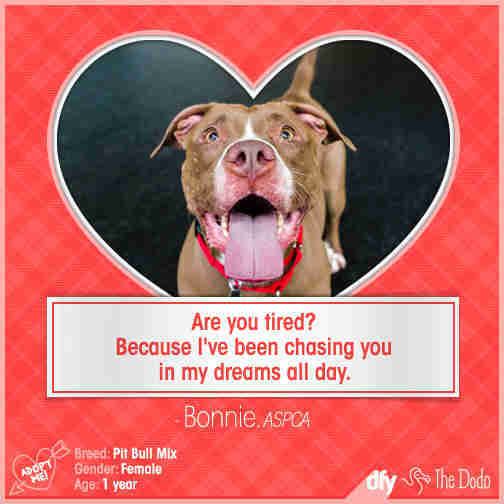 "Learn more about Bonnie at the ASPCA. This 10 year old domestic shorthair "is a very chatty girl, loves being pet on her head and simply loves to sit next to you and watch you work and will eventually snooze off once she's had enough of proof-reading!" 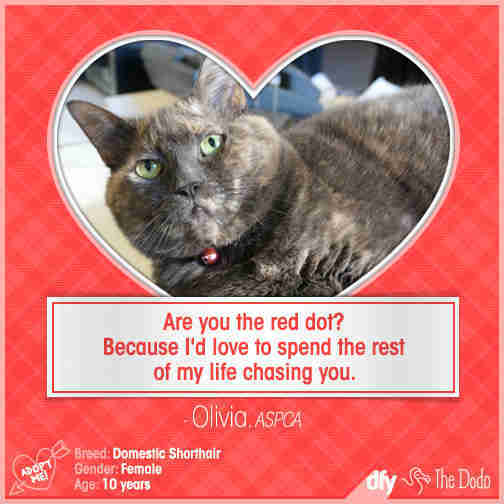 Learn more about Olivia at the ASPCA. How can you resist that smile? Pepper is a cheerful, playful, affectionate girl of about four years. 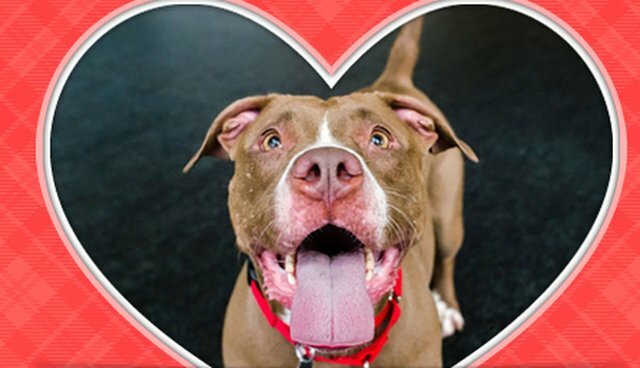 An Animal Care & Control of NYC (AC&C;) staff member says, "She is a super sweet and loving dog," and a volunteer notes, "Her sunny, happy personality seems to be noticed by everyone." 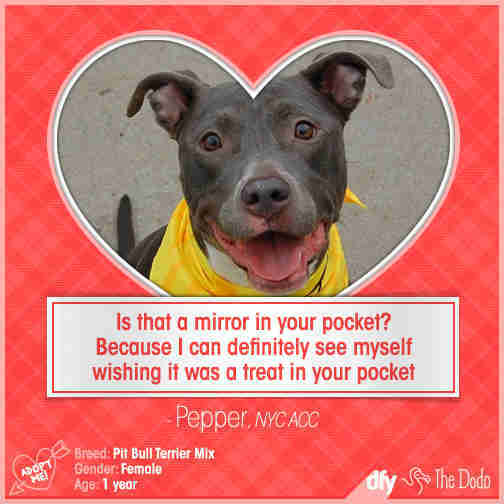 Meet Pepper at AC&C;'s Brooklyn Care Center, at 2336 Linden Boulevard (open 12-7pm daily), or email adoption@nycacc.org with her A#: A0892272. She is a 9 year old, female, Pug/Boston Terrier. 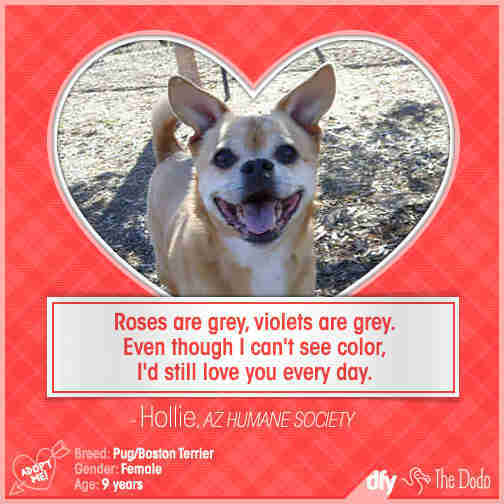 Learn more about Hollie at the Arizona Humane Society. It's hard to resist Morgan's adorable ears and cow-like markings! An Animal Care & Control of NYC (AC&C;) volunteer notes Morgan "is all puppy, full of energy and playful as can be." 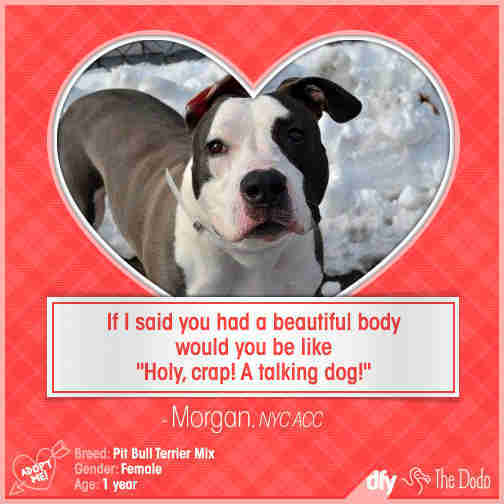 Meet Morgan at AC&C;'s Staten Island Care Center, at 3139 Veterans Road West, or email adoption@nycacc.org with her A#: A0988258. She is a 3 year old, female Tuxedo cat. 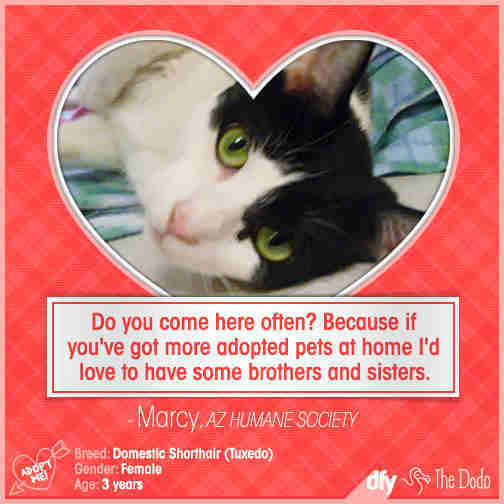 Learn more about Marcy at the Arizona Humane Society.